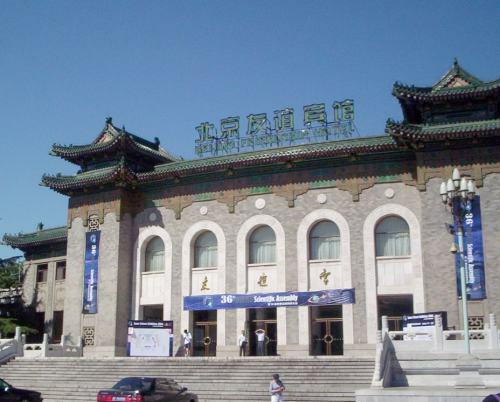 In July 2006 I visited Beijing, China, for the 36th COSPAR conference. COSPAR is the Committee on Space Research, an international organization promoting international-level scientific research in space. 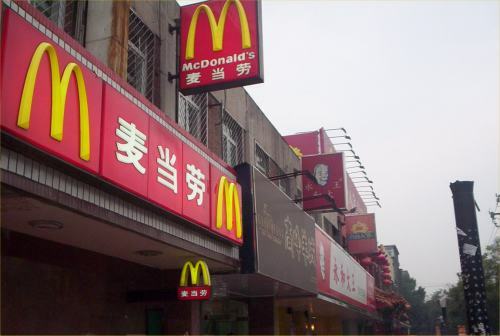 This is the Shuang'an shopping center near the Beijing Institute of Technology. Modern highrises abound in Beijing, and much construction is underway--all planned to be completed before the 2008 Olympics. 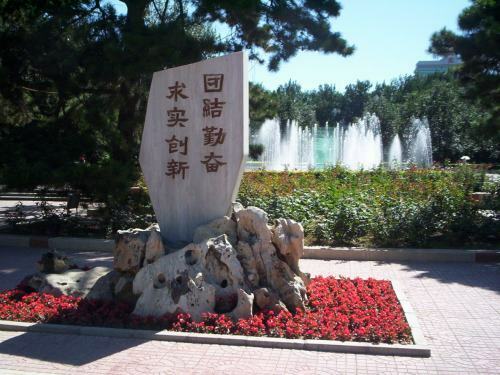 COSPAR sessions were held at the Beijing Institute of Technology in northwestern Beijing, 8 km from the Forbidden City. This is the Teaching Center building at BIT, seen from a campus park. 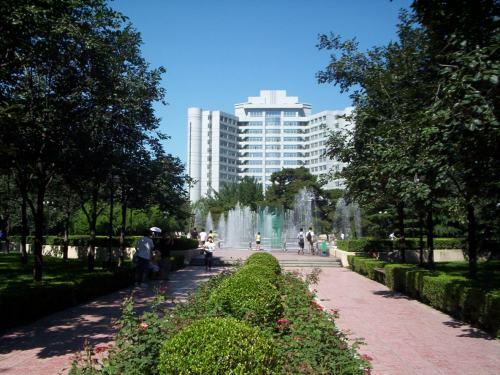 Another view in the park in the Beijing Institute of Technology. 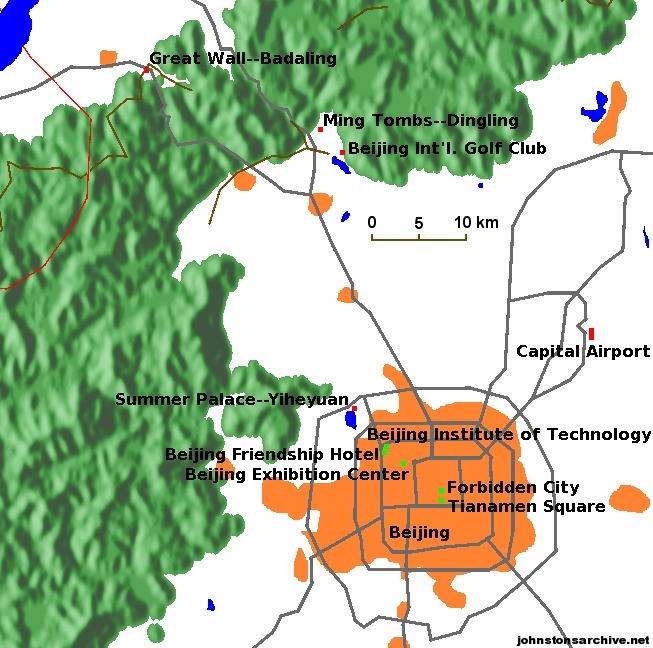 The Chinese have placed importance on including green areas in Beijing, although this does little to stifle the high level of pollution in the city. 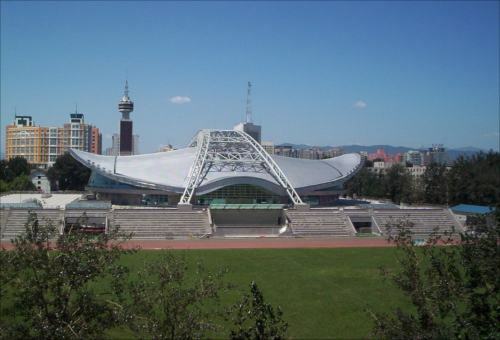 A stadium on the campus of the Beijing Institute of Technology, with some of Beijing visible in the background. 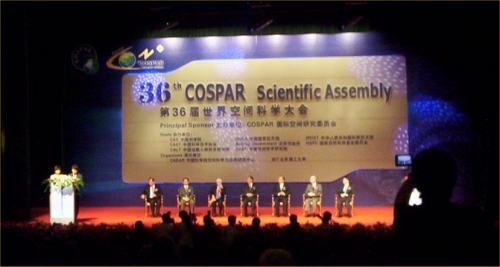 The opening ceremony for COSPAR was held at the Beijing Conference Center next to the Beijing Zoo. The dignitaries included high ranking Chinese officials--an indication of the high priority on science and technology in the People's Republic of China. Tower at the Beijing Conference Center. 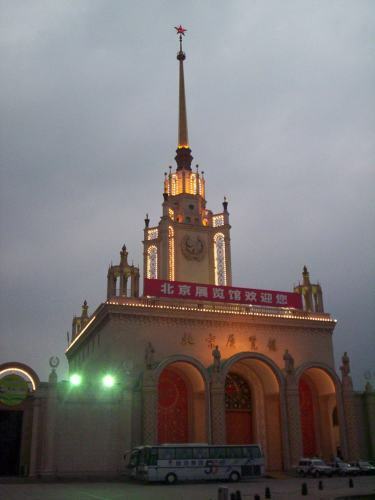 The Beijing Conference Center was built in 1954; at the time, the People's Republic of China was still on friendly terms with the USSR, and the Center shows Russian influence on the architectural design. 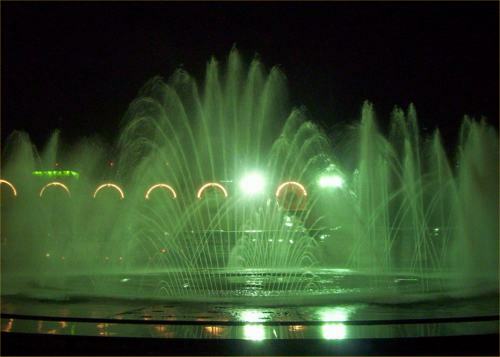 Fountain at the Beijing Conference Center at night. We stayed at the Beijing Friendship Hotel near the Beijing Institute of Technology. The Friendship Hotel is actually an extensive complex with multiple buildings separated by beautiful landscaping. 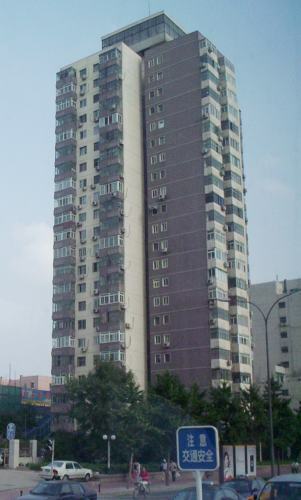 Beijing has many highrise structures expressing Western architectural influences. The highrise apartments show more variety in age and apparent quality. 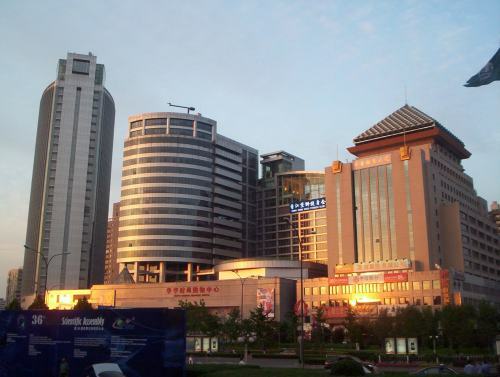 Beijing has a population of 12,000,000. 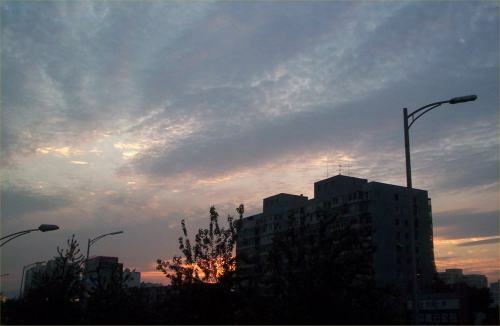 Sunset on a Beijing street. Copyright © 2006, 2008 by Wm. Robert Johnston. All rights reserved. Last modified 22 August 2008.